My kids love fish, both of them. Our precious daughter (3 years 1 month) loves fish a lot (including small whole ones, like sprats and Baltic herring in various forms) and she adores shellfish, including mussels and sea whelks (bulots) and such like. Our little boy (1 year 2 months) prefers fish fillet at this stage, but that's fine with me. Here's a little quick delicious dinner idea that is suitable both for the little eaters and the large ones. The secret? Dredging the fish pieces into (wholemeal and coarsely ground) rye flour. Of course, you could use oatmeal or plain wholewheat flour, but somehow the rye works especially well with oily fish like salmon. I love serving this dish with mushy-minty peas, but simple mashed potato would be a good accompaniment as well. Remove the skin from the fish filet and cut the fish into chunky fingers. Season generously with lemon pepper seasoning and a little bit of freshly squeezed lemon juice. 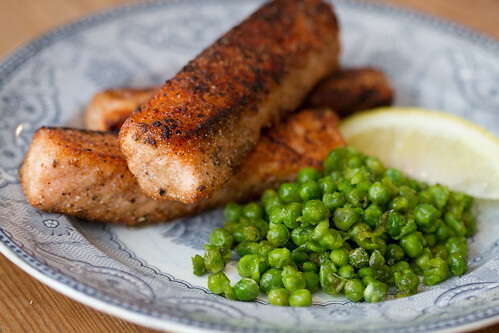 (* If you're using salt-free lemon pepper, then sprinkle some salt over the fish as well). Dredge the fish fingers into rye flour. Heat oil and butter on a frying pan. Brown the fish fingers on all sides and cook for a few minutes, until done. 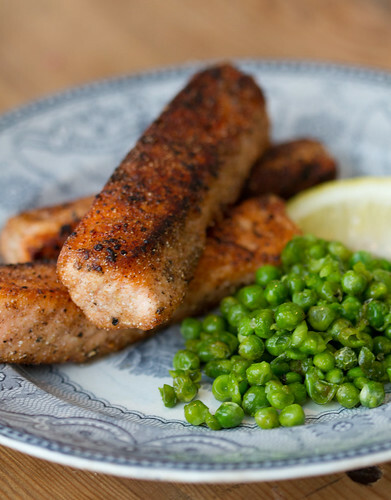 Serve with mashed potatoes and/or mushy peas. To make the latter, simply heat some butter in a small saucepan. Add frozen peas, season with salt, pepper, lemon juice and mint, and heat through. Mash lightly and serve with the fish fingers. And not a chip in sight! Using polenta for the coating also works with some fish. Indeed, Roxy. Thank you for the polenta tip!